I was already researching a potential series for BBC Four about the National Parks of Great Britain when I heard about the gold mine application in Loch Lomond. At that time I'd also spoken to someone from the Friends of the Cairngorms about a controversial funicular railway in that national park and I thought this might make a good story. But I came up to Loch Lomond to gauge the strength of feeling over the gold mine. This was the summer of 2010 - and in just a few weeks, a decision was going to be made whether to approve or reject the mine. John Riley, the community council leader for Tyndrum - near where the mine would be located - was campaigning to get the mine approved. It would provide up to 50 jobs for people in the area and help stop a tiny remote community from slowly disintegrating due to lack of job opportunities. The mine had been given approval in the 1980s before the national park was created and back then the planning decision was made by Stirling Council. But at that time the mine had only really just got started when the price of gold crashed and the mining company pulled out. Since then farmer John Burton has had to look at a nasty scar on his land every day when he tends his sheep and he's been hanging onto the hope that one day the mine will spring back into action. Because the mine had been approved in the past, the feeling in the community was that it would almost certainly be approved again this time. But two weeks before decision day, the head of planning at the Loch Lomond and Trossachs Park Authority, Gordon Watson, recommended to the board that they reject the gold mine. Mr Watson's decision was based on the suggested restoration techniques put forward by the gold mine company. He felt the landscape around Cononish Glen where the mine is situated would likely be damaged permanently by a huge tailings dam which is where the spoil from the mine would be stored. His recommendation infuriated the locals, and two weeks later the board duly followed his suggestion and narrowly voted against the mine. John Riley, the community council leader, was furious. He immediately started a media campaign, describing the people who'd made the decision as "living in ivory towers". 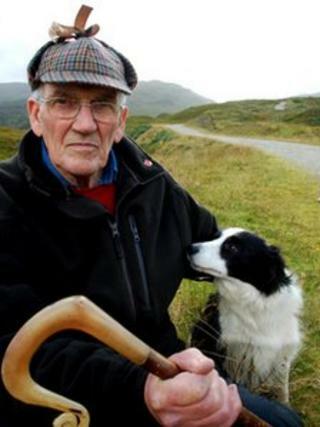 Mr Riley had been a strong supporter of Tyndrum being included in the national park when it came into being eight years ago and it lies just on the park's border. But now he was campaigning to get the village taken out of the park. He did radio and television interviews and put his case to the park authority's chief executive, Fiona Logan, during a heated discussion which I filmed. In the end, a few weeks later, mining company Scotgold Resources decided to reapply for the gold mine and negotiations with the park authority started up again. So, before long Mr Riley's campaign to come out of the national park subsided, as renewed optimism that perhaps the mine might get approved a second time around took hold among the villagers. I personally thought it was strange that the gold mine could have been rejected, but then a year later could be seen as a positive thing. Indeed, early in October this year Gordon Watson once again made a recommendation to his board - and this time it was for approval. What had changed? Well, the tailings dam for keeping spoil was under half the size of the original, and the restoration techniques to return the glen to its former beauty once the mine had ceased production had improved a lot. But even so, it's still a mine. Still a huge blot on the landscape. Maybe the big consideration in all of this is that in Scotland national parks have a key aim to help the socio-economic wellbeing of small rural communities, like Tyndrum. It's a greater requirement in Scottish national parks than it is in their English cousins. So the park authority needed to try and find a way of helping the mine become a reality so that jobs could be created and prosperity could be brought into the area. As you will probably already know, the board voted unanimously to approve the goldmine this second time around. No-one knows for sure what the long-term costs might be for the beautiful glen where the mine will be situated, but the villagers of Tyndrum have been given something very precious by this decision. Tales from the National Parks is on BBC Four at 21:00 on Sunday 6 November.